New research out from CapGemini revealed that a third of consumers surveyed would rather wash dishes than go shopping. Before you dismiss their responses as possibly being a bit sarcastic, consider this: washing dishes can be a tedious chore, but at least it ends up on a high. You see the fruit of your labour and often gain kudos for a job well done. That same sense of satisfaction cannot always be gained from the average shopping trip. While I accept that a 360-degree dishwashing simulation might not attract throngs of eager shoppers, immersive experiences are a growing trend. Anyone who’s ever scored tickets for the wildly popular London show “You Me Bum Bum Train” or watched AIG’s 360-degree virtual reality demo of the New Zealand All Blacks performing the Haka before a rugby championship will know what I’m talking about. Take for example, in select high-end department stores Dyson entices shoppers to splash out £300 on its Supersonic hair dryers by providing free wash-and-blow-dries in temporary salons. Unfortunately it’s hard enough for retailers to manage the basics, never mind stage immersive performance art. According to the same CapGemini research, the top frustrations that consumers face in stores that cause them to go online are pricing, long queues, inability to locate products, lack of personalisation and poor service. 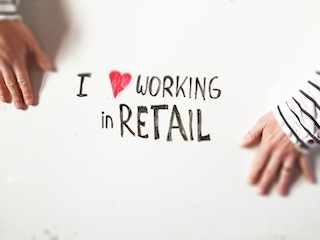 With only a 60% employee turnover rate, the average retailer struggles just to maintain competent, friendly staff. The wakeup call for retailers is loud and clear: invest more in people and digital initiatives to make offline shopping more compelling. So why do so many retailers keep hitting the ‘snooze’ button on these? Because investments have historically been seen by many as too hard and expensive. And when having to constantly dodge moving threats like business rates rises, Brexit uncertainty and minimum wage hikes, some are content to just survive. So how to bridge the gaping chasm between survival mode to the promised land of immersive experience retailing? To answer this question, let’s look at some of the most important elements of putting on a great show. Investing in people sounds like such a cliché, but I can’t stress the importance of it enough these days, when shoppers can so easily compare prices and quality on their mobiles. Sales assistants not only have to be trained and empowered to help customers, but able to stay one step ahead of them. Creating the right experience depends first and foremost on an all-star cast of people – finding them, giving them the tools and confidence to succeed, and keeping them. Above all you need a genuine interest in human beings along with tireless energy, enthusiasm and patience. It sounds strange that I need to spell this out, but you’d be surprised at how many retailers I talk to that confess that they aren’t ‘people people’. My experience helping to launch Niketown’s flagship London store proved that it’s possible to buck the high employee turnover trend. In our first year we had a 90% annual staff retention rate, won the Investors in People award and had lots of fun besides. I won’t lie: it was very hard work but equally it was very rewarding. Yes, it costs more initially to provide the kind of perks and incentives to retain good staff, but these are more than offset by high sales performance and not having to constantly recruit and train. Since your “set” or shop floor is the first element of the in-store experience, its job is to convey the information needed to launch the story of your brand. That golden rule about first impressions really matters. Visitors who walk into a store that’s messy, disorganised or understaffed are likely to turn on their heel and fire up Amazon. Getting the basics right like complying with health and safety and privacy legislation really matters too. You don’t need the added stress of a surprise visit from the auditor to disrupt or even shut down your operation on a busy day. Those fortunate enough to have seen one of the new immersive theatre performances will understand the ‘wow factor’ of a flexible set that responds to audience members. To thrill your shopping audiences and keep them coming back, your environment must also be equally engaging and adaptable according to shoppers’ needs, wants and actions. Do your windows draw people in? Are your promotions and high-tech demonstration areas compelling and well-staffed enough or are customers just walking past them? Can customers find items to go with their initial purchase? Do shoppers have to wait a long time to try on items or make purchases? Essentially – are you visitors having fun? Video-based analytics systems that support all these basic elements of customer experience are not only readily available and easy to install and use, but often serve multiple purposes as they are essential to support loss-prevention efforts. My involvement with Store of the Future (SOTF), the first retail innovation lab in The Netherlands, helped me see this very clearly. SOTF tested many new technologies including augmented reality, wearables and holograms in a live environment to see how they performed in the real world. We got involved as the sole analytics partner of SOTF by installing our technology, which transforms IP video cameras normally only used for surveillance into IoT sensors that gather all the data for managing and optimising retail space. When the SOTF retailers were armed with valuable data about visitor numbers, where the in-store ‘hotspots’ were and which products and displays were being touched and felt the most, they were then able to continually fine-tune pricing, promotions and staffing to improve outcomes. Accurate people counting – knowing how many people enter your store and when is essential for being able to make optimal staffing decisions. Accurate is the operative word here; Wi-Fi and beacon technology is not reliable enough to count people accurately. In SOTF, WiFi counted 2.5 times as many people that were actually entering the store due to people carrying multiple devices and other technical weaknesses. SOTF decided not to compare mobile data (via beacons) in the people counting test because it required too much of the visitors – installing and registering an app and turning on Bluetooth – to make a fair comparison. Using video cameras as sensors to detect adult humans proved the most accurate way to count people. Heatmaps – indicates how long and how many people are dwelling in different locations to determine whether display areas, promotions and demonstrations are effective or not. Also flags whether queues for fitting rooms and tills are too long, causing shoppers to abandon their purchases. A jewellery retailer we work with used our heatmaps to test whether customers would gravitate towards stations with tablets to search for merchandise and carry out transactions. In their case, the tablets proved unpopular. It turned out customers who were looking for a more immersive shopping experience that they couldn’t get online. 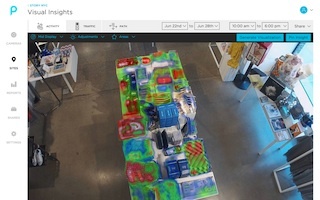 Pathmaps – shows the journey shoppers are taking throughout a store to help managers understand things like which merchandise is drawing people in; the sequence of actions shoppers take. For example a popular path might be a customer first being attracted to a pair of jeans displayed in the window, enters the shop, and then searches for a casual top to go with them. An immersive retail experience that integrates all these fundamentals really well is our customer STORY, a 2,000sq ft space in Chelsea, New York City. STORY sells like a store but changes every four to eight weeks like a gallery. Its founder Rachel Shechtman describes the approach as ‘ephemeral retail’ explaining, “All of the merchandise changes, all of the fixtures changes and the design changes – the only thing that’s constant is that we change.” People counting, heatmaps and pathmaps all help STORY to understand the customer and the experience it’s providing. They enable Story to do things like live A/B testing on promotions and tweak merchandising and item positioning based on customer behaviour. If you still think it all seems too hard and expensive consider this: the last two examples I cited are independent, entrepreneurial retailers with the vision and courage to overcome their stage fright and put on a new kind of show. We’re pretty confident that their customers will much prefer visiting and shopping in their stores instead of staying home and doing the washing up!